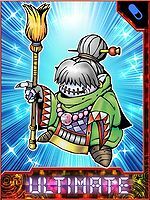 An Ancient Digimon that has the appearance of an old woman. According to rumor, it is whispered that a Rosemon was placed under a spell and turned into this form. 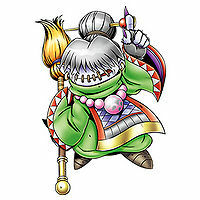 It possesses the Special Move "Empress Haze", which completely erases evil viruses with a swing of the magical broom it holds in its right hand. Ultimate. Its Special Move is Empress Haze. — Digimon Tamers: "Little World! 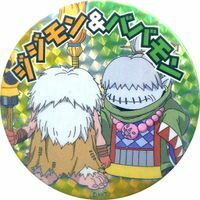 Jijimon and Babamon in the Strong Wind Valley"
An Ancient Digimon that has the appearance of an old woman. It is whispered that a Rosemon was placed under a spell and turned into this form, but no one really knows for sure. It completely erases evil viruses in an instant with a swing of the magical broom it holds in its right hand. 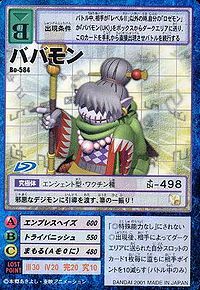 An Ancient Digimon that has the appearance of an old woman. According to rumor, it is whispered that a Rosemon was placed under a spell and turned into this form. According to rumor, it is whispered that a Rosemon was placed under a spell and turned into this form. 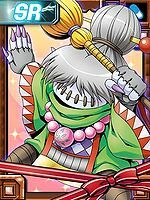 Its Signature Move is trying the opponent with the magical broom it holds in its right hand, and inflicting its punishment on evildoers (Tri-Banish). Its Special Move is completely erasing evil Digimon with a swing of its broom (Empress Haze). | Baba (婆) meaning old woman. Anime/Manga Digimon Tamers: "Little World! 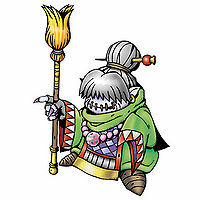 Jijimon and Babamon in the Strong Wind Valley"
Empress Haze  エンプレスヘイズ Enpuresu Heizu Empress Haze/Embrace Haze Erases viruses with a single swing of its broom. 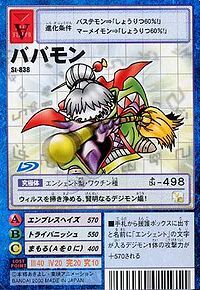 Tri-Banish [N 1] トライバニッシュ Torai Banisshu Dark Broom Tries the opponent with its broom, and inflicts its punishment on evildoers. Babamon is the wife of Jijimon and they are constantly bickering. Babamon is the princess of Shinobi Zone. 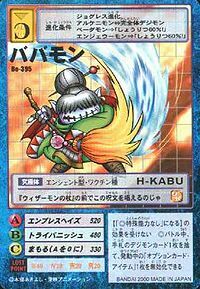 Babamon is only obtainable as a collectible card. Its card is part of the Jiji-Baba Set (ジジババセット Jiji-Baba Setto) set. 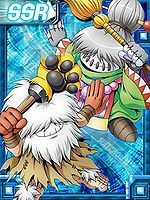 Babamon is available as a Digimon Medal. 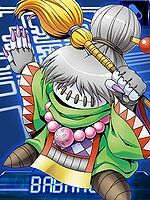 This wise, old Digimon lady sweeps viruses away! Recite this spell on Wizarmon's Wand. It sends off evil Digimon with a sweep of its broom! 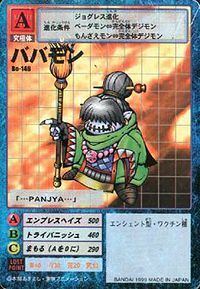 ↑ Tri-Banish is a combination of "trial" (トライアル) and "banish" (バニッシュ), which is synoynmous to the word "punish" (パニッシュ), and is a reference to the phrase "trial and punishment".